Research teams from the Department of Preventive Medicine at the Icahn School of Medicine at Mount Sinai, in collaboration with Rensselaer Polytechnic Institute (RPI), were recently awarded two grants from the NIH’s new Child Health Environmental Assessment Resource program (CHEAR) to study “exposomics,” the comprehensive study of environmental exposures in humans from conception through development. Mount Sinai is the only institution to receive grants for two of CHEAR’s three components. The research teams from Mount Sinai are led by TCEEE members Dr. Robert Wright (Chair) and Dr. Susan Teitelbaum. Read more about the partnership between the Icahn School of Medicine and RPI here. Click here to view the Mount Sinai press release. This entry was posted in In the News on September 30, 2015 by mountsinaitceee. 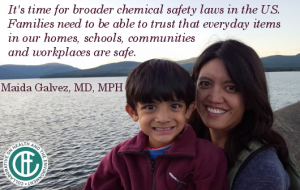 In honor of World Environmental Health Day, the Collaborative on Health and the Environment (CHE) published a series of essays written by leaders in the field of children’s environmental health. Dr. Maida Galvez, Director of the Region 2 Pediatric Environmental Health Specialty Unit (PEHSU) in the Department of Preventive Medicine at Mount Sinai, and co-director of the TCEEE Community Outreach and Engagement Core (COEC), describes the landscape of consumer products, chemicals, and environmental exposures that present a concern for today’s families and how we can take a stand for children’s environmental health. Click here to read her blog post. Mount Sinai staff members organize and attend NIEHS mixtures workshop. Click here for a link to more information from the National Institutes for Environmental Health Sciences. This entry was posted in In the News on September 2, 2015 by mountsinaitceee.